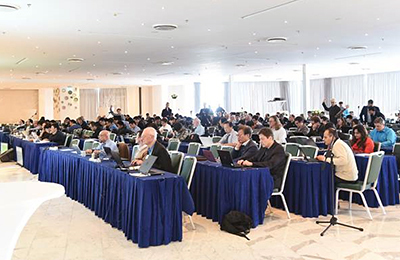 The December 2018 quarterly Third Generation Partnership Project (3GPP) meetings in Sorrento, Italy, addressed standards in several areas relevant to mission-critical broadband in three separate plenary group meetings. With the conclusion of the 3GPP plenary meetings, Release 15 is now considered complete, including 5G new radio (NR). However, 3GPP continues to address additional 5G NR architectural options that were identified earlier and will be added into the completed Release 15 at a later date. Release 16 was previously targeted for completion by December 2019 in all of the 3GPP technical specification groups (TSGs) — radio access networks (RANs), service and system aspects (SA), and core network and terminals (CTs). However, the RAN Release 16 work schedule was delayed to now conclude by March 2020. Standards followers remember the multiple architectural options defined for the 5G system that 3GPP committed to standardize; however, the completed Release 15 work does not contain options four and seven. Despite intensive work during the past quarter, the Release 15 5G NR “late drop” freeze to support options four and seven missed its committed date and is now projected for March 2019 completion. Architectural option four is a non-standalone (NSA) NR-assisted dual-mode mobile connected to a next-generation core network (NGCN) configuration, while option seven is a non-stand-alone (NSA) Long Term Evolution (LTE) Assisted dual-mode radio connected to the next-generation corporate network (NGCN) configuration. These NSA 5G NR options will use the existing LTE radio and core network as an anchor for mobility management and coverage while adding a new 5G RF carrier. As a result of the revised RAN schedule, the SA and CT TSGs are evaluating their completion dates and will make any necessary adjustments to the December 2019 target during the March 2019 plenary meetings. • Access to unlicensed spectrum: This work item will specify NR enhancements for access to unlicensed spectrum, enabling operation of NR in the 5 and 6 GHz (5.925 – 7.125 GHz in the U.S.) unlicensed bands, taking into account regulatory requirements. • Wider channel bandwidths in band n7 — a 5G band that is the current LTE band 7: The objective of this work item is to support channel bandwidths of 25, 30, 40 and 50 megahertz in NR band n7. • Study on 7 – 24 GHz: Previously, 3GPP completed Release 15 with NSA and stand-alone configurations in a variety of operating bands across various ranges (less than 6 GHz and greater than 24 GHz). This study item addresses the missing 7 – 24 GHz range. During the plenary, the First Responder Network Authority (FirstNet) presented its contribution titled “Mission-Critical Services and NR V2X.” This contribution requested support for public-safety direct-mode capabilities in 5G, potentially leveraging the existing vehicle-to-everything V2X work. V2X communications include device to device (D2D) communications defined as part of proximity services (ProSe) in Release 12 and Release 13 of the specification. As part of ProSe services, a D2D interface was enhanced for vehicular use cases, specifically addressing high speed and high density. FirstNet, the authority overseeing the U.S. the nationwide public-safety broadband network (NPSBN), has been driving this effort on behalf of public safety and collaborating with key operators and governmental organizations from around the globe. Overall, two leading operators and 11 public-safety governmental organizations worldwide supported FirstNet Authority’s contribution. During the next three months, the RAN plenary will analyze the list of requirements identified by the public-safety community. The primary concentration for the CT plenary focused on cleaning up 3GPP Release 15, including the completion of specific enhancements for 5G and mission-critical services. Since June, 3GPP has completed Release 15 work on mission-critical push-to-talk (MCPTT), mission-critical data (MCData) and mission-critical video (MCVideo). One MCPTT feature and five MCData features deemed to be lower priority for Release 15 may appear in future releases. MCVideo reached completion of all planned Release 15 features. Release 16 work is underway, including phase two of 5G. Important to public-safety communications, the release includes the interworking mission-critical services over LTE with existing LMR systems. With a significant push during the past six months to move interworking of MCPTT toward drafting completion, the goal from this plenary meeting is to complete drafting in the next three months and to move drafted text into the standards by June 2019. An earlier date was targeted, but the amount of work to accomplish this task resulted in a June target date. FirstNet’s standards representatives continue working with other 3GPP members to push this work and meet the June schedule. In parallel to the 3GPP’s efforts, the LMR-related work continues in the Alliance for Telecommunications Industry Solutions (ATIS) and the Telecommunications Industry Association (TIA), which are North American standards development organizations, where the FirstNet Authority’s standards representatives are also participating. This work standardizes the interface on the LMR side of a 3GPP-defined interworking function, while the 3GPP work focuses on the LTE side. The ATIS/TIA work should be completed around June 2019 as well. The major features that first responders expect, such as group calls, emergency group calls, private calls, encryption, and small data exchange, are being built into the basic interworking effort. A hot topic during the meeting was the requirement for a 5G broadcast capability in Release 16. An example application for 5G broadband is a large incident involving 1,000 first responders in a small area. The 5G system does not have a broadcast capability equivalent to 4G LTE multimedia broadcast multicast services (MBMS). The chair of the RAN plenary noted that inclusion of 5G MBMS is a possible feature for Release 17. In addition, final approval to solidify a mission-critical access control framework in 5G occurred in the SA and CT plenaries, spearheaded by FirstNet. The framework ensures devices can determine when they are allowed to request mission-critical priority access to the network, enhancing the quality of service, priority and pre-emption (QPP) capabilities defined in 5G. • The study item on requirements for enhancement for unmanned aerial vehicles (UAVs) has reached 20 percent completion. • The study item on requirements for multimedia priority service (MPS) phase two reached 65 percent completion. • The study of enhancements to service-based architecture for location services reached 100 percent completion and will begin normative work. • A new work item on 5G location service to start normative work with a projected end date of June 2019 was approved. The intent is to improve location accuracy. This work item is of high importance to first responders and commercial operators that must meet stringent requirements for location accuracy for emergency calls. • The study item for enhancements to the service-based 5G system architecture is also 100 percent complete. A new work item on enhancements to the service-based 5G system architecture was also approved to start the normative work with a projected end date of June 2019. This new work item will provide higher flexibility and better modularization of the 5G system for easier definition of different network slices and better reuse of the defined services. • The study item on advanced V2X services architecture reached 88 percent completion. The SA V2X work is complementary to the V2X work in RAN. • A study on architecture aspects for using satellite access in 5G is at 35 percent completion. • The study on the use of 256-bit algorithms for 5G is complete. • Enhanced MCPTT architecture phase two reached 35 percent completion and is targeted for June 2019. • Enhanced mission-critical system migration and interconnection is at 10 percent completion and due in June 2019. • MBMS application programming interfaces (APIs) for mission-critical services moved from 15 to 65-percent completion during the past three months and is targeted for completion March 2019. • Enhanced mission-critical communications interworking with LMR systems is at the 15-percent completion level. This add-on functionality for the existing LMR-MCPTT work and is targeted for June 2019. • Enhancements to functional architecture and information flows for mission-critical data progressed from 10 to 40 percent completion during the past three months and is targeted for June 2019. Tremendous progress continues within the standards development organizations for commercial wireless technologies worldwide. Moving forward, the FirstNet standards team will continue to advocate and provide technical contributions for the unique communications needs of public safety within these organizations. Dean Prochaska is the senior director of standards for the First Responder Network Authority (FirstNet). Email feedback to editor@RRMediaGroup.com.